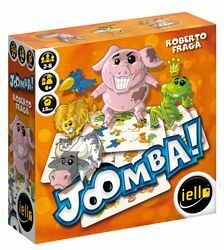 Joomba is a simple party game. You reveal a card with 10 animals. 1 of them is present 1 time. 1 of them is present 2 times. 1 of them is present 3 times. 1 of them is present 4 times. You must be the fastest player to imitate the animal present the required number of times (you see this information on the back of the next card of the deck). 3 different ways to play.